New Years Eve is by itself a day filled with excitement and anticipation. Here in the ski town of Park City, it happens at one of the busiest weeks of the year. The whole world visits PC for their holiday vacations, the town is a flurry, and if we’re lucky, the weather hits us with tons of new, gorgeous powder. Tonight, there is a party at every bar and restaurant on Main Street. The resorts are all having events, and you will not be wanting for exciting entertainment. A few ideas from VisitParkCity.com. For me? I’m all about that hot date with my sofa. No parties for me. But, I review my year and set my intentions for the coming year. And I give in to one particular superstition: Lucky lentil soup. 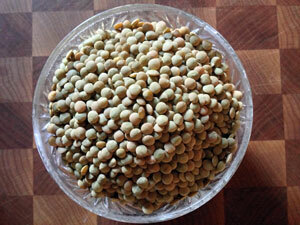 Lentils are healthy, humble, and delicious. And for New Year’s, they cater to the tradition that eating coin-shaped food will bring good fortune for the coming year. I like the reminder that we can make something fabulous out of even the most humble of situations. So tonight, I will be tucking into a beautiful bowl of lentil soup, thinking about my year, and getting ready for 2015 to be my best year yet. 1 cup vegetables diced, such as carrots, potatoes, celery, etc. 1. In a heavy pan or dutch oven, cook the bacon until it is crispy, remove and reserve. 2. Cook the onion in the bacon fat until the edges begin to turn golden. Add the garlic and cook for 30 seconds. 4. Check seasoning for salt and pepper. Serve with a bubbly beverage, a crusty bread, and of course, sharp dill pickles.